The Forza Racing Championship is Microsoft’s premier competitive racing esports series played on the company’s flagship racing franchise for Xbox One and Windows 10 PCs, Forza Motorsport. Over the next year, Microsoft and its Forza Motorsport development team at Turn 10 Studios will take racing esports to the next level with the Forza Racing Championship 2018 season. Drivers will compete for the largest prize pool in the history of ForzaRC, where more than $250,000 in prizes will be up for grabs. 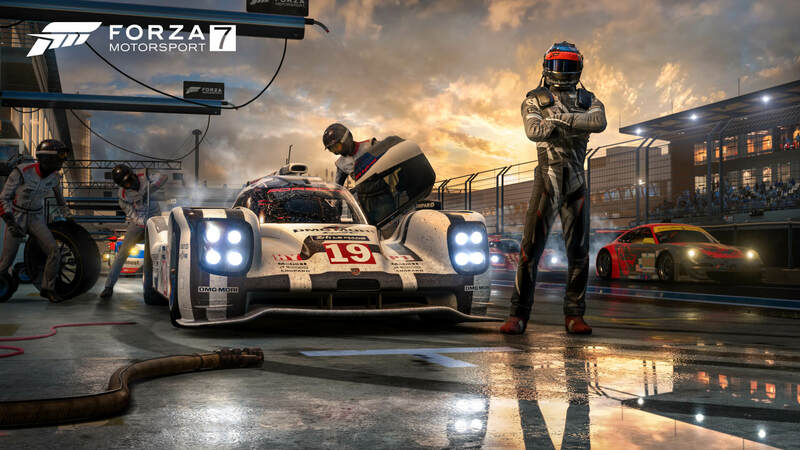 In advance of the 2018 season start, the Forza Racing Championship will host a Pre-Season Invitational Presented by IMSA on March 24th in Seattle, Washington, the home of Turn 10 Studios. Microsoft has invited some of the best drivers and teams in the world of Forza Motorsport to compete and set the stage for a season of exhilarating races. Following the Pre-Season Invitational, the regular season begins. The ForzaRC 2018 season is split into two series, each consisting of seven weeks of ranked events with bi-weekly broadcasts and culminating in a live playoff event with a prize pool of $75,000. The first of these playoff events will be hosted this June in Seattle, the other from Mexico City in September. When the competition begins on April 2nd, all registered drivers begin their race to the top of the leaderboard. As part of each seven-week series, drivers will compete in ranked events, earning points and climbing the leaderboard as they go. 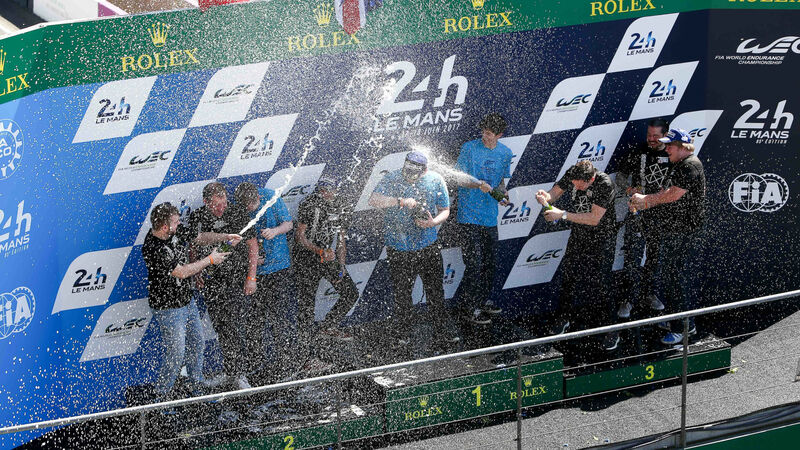 ForzaRC Season 3 finalists atop the Le Mans podium in June 2017 to celebrate the victory of Michael “AMS RoadRunner” Coyne of team Alien Motorsports. 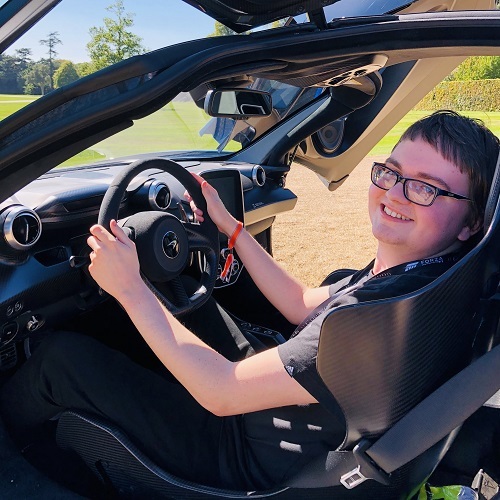 At the end of the two series, the top 24 drivers will be invited to compete in the Forza Racing World Championship 2018 finale held in London, England for their shot at a $100,000 prize pool and the title of Forza World Champion. Catch the official Forza Racing Championship broadcasts on Mixer, with video-on-demand shared on the all-new ForzaRC YouTube channel featuring highlights, interviews, past broadcasts, and more. 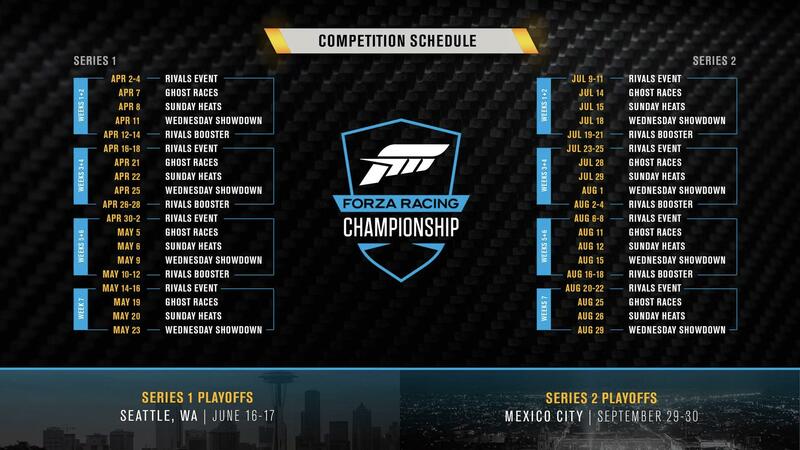 Find the official 2018 broadcast schedule for the Forza Racing Championship in the official screenshot above and check back on FullThrottle for our coverage of each ForzaRC event throughout the year. Registration for the Forza Racing Championship 2018 season is now open – sign-up today on the official Gfinity website and hit the track for some practise in the all-new ForzaRC Rivals event available in Forza Motorsport 7. Plus, don’t miss the all-new ‘Spectate’ and ‘Seed the Grid’ esports features that take Turn 10’s latest flagship racing game into the competitive spotlight. 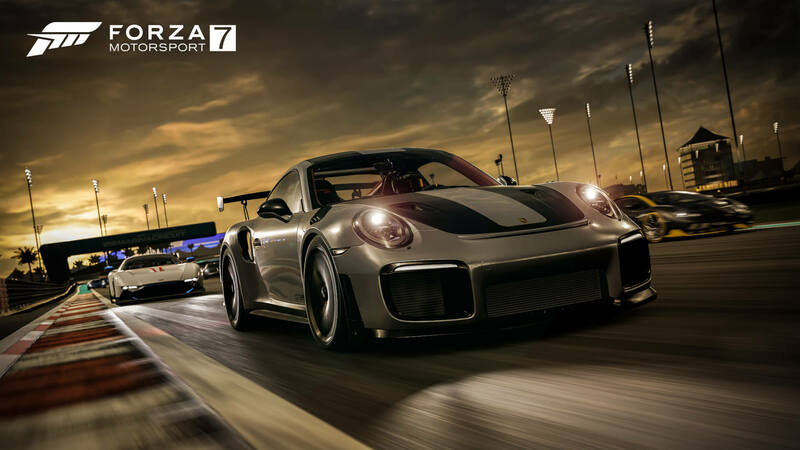 The Forza Racing Championship 2018 season has been built on the award-winning Forza Motorsport 7, which features more than 700 cars, complimented by the largest collections of Ferraris, Lamborghinis, and Porsches, all driveable across more than 30 track locations at a blistering 60fps in 4K resolution on Xbox One X and Windows 10 PC. 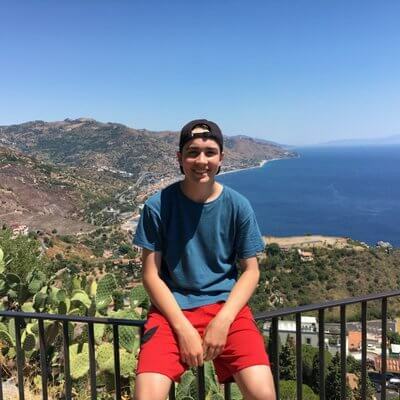 Racing Esports - Where Are We At, Where Are We Going?